WHAT IS GARDEN HISTORY ALL ABOUT? Many people might consider that Australia is too young a country to have historic gardens. I daresay that's true when compared with England where there are beautiful gardens as featured in this photo, which I took when visiting a few years ago. However,, there is a Historic House Trust in Australia, and with them there are historic gardens. Some of them have fallen to neglect and some have been restored or are in the process of being restored by members of the "Garden History Society." So it would seem that there are indeed many historic houses in Australia, and there are plenty of early 20th century houses which would look so much nicer with a complimentary garden. There are also hidden gems in our country which aren’t normally open to the public, so how can we see them. Let’s find out what the "Garden History Society" is and how we can see hidden gems. There are branches around Australia of the Australian Garden History Society, but you don’t have to be a member to go along to one of their talks, activities or events. If you have any questions about the History of Australian gardens, drop us a line to realworldgardener@gmail.com or write in to 2RRR P.O. Box 644 Gladesville NSW 1675. Have you ever tried that dob of green paste that comes with Sushi and Sashimi? 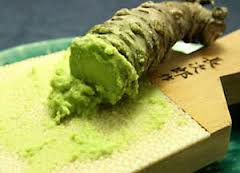 Did you know that the green paste sold as Wasabi in the supermarket is actually horseradish that’s been dyed green. Yes it’s still got that bite but’s it’s not Wasabi. 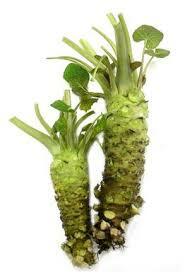 Wasabi is Wasabi japonica, and is a semi aquatic Brassica related to horse radish Armoracia rusticana. You probably wouldn’t be surprised to learn that Wasabi grows wild in Japan. In Japan, Wasabi evolved at the edges of mountain streams and has adapted to cope with low levels of light, low temperatures and high humidity. Did you know that the Japanese consider wasabi a gourmet treat, and is used in everything from cheese and salad dressing to wine and even ice cream and toothpaste? 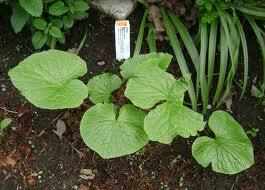 Wasabi is a herbaceous perennial plant with a thick knobbly rhizome only about 10-30cm long and about 2-5 cm thick. The part you use is that thick rhizome that needs to be grated. Wasabi’s bite is pretty powerful and you only need a ¼ of a teaspoon of the stuff to get steam coming out of your ears, water running out of your eyes, and the feeling that your nose is going to lift off into space. Trying to buy the real thing is about as difficult as trying to buy hen’s teeth. Mainly because the real thing is frighteningly expensive and doesn’t keep for very long. The ideal is to grow your own. You can buy the rhizome to grow some of your own, from mail order catalogues or online. Although Wasabi prefers a cool and shaded position, in moist soils, the variety Daruma will tolerate warmer conditions than most. Daruma is supposed to have superior green colour, size and crisp taste, and produces a better quality stem (used extensively in salads) and generally has a more attractive appearance. 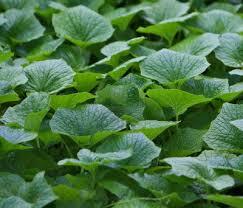 Traditionally, wasabi is best produced in clear, cool (120-150C) running water, with plenty of shade in the hot months. Yes, I believe that it does well in Tasmania. Wasabi is best planted from Autumn through to early summer. The tip is to plant it in a cold damp area. Think of a fernery in dense shade, 80% or more to protect from heat, then you’ve got the right growing conditions. Generally, wasabi plants need about 18 months to 2 years before the rhizome matures to full size. How to Grate Your Wasabi! But wait, this is sounding a bit complicated plus even if you’re successful in growing a decent sized rhizome, you can’t just grate it any old way, no-o-o. Grating according to Japanese tradition, has to be just right. The wasabi cells need to be torn apart to set off a chemical reaction, which after a few moments rest, develops its wow flavour. You need just that right type of very fine grater. You can’t use a nutmeg grater because it’s too coarse and slices instead of grinding. Plus, you have to hold the rhizome at 450 and use a circular motion with your Wasabi on their special grater. The grater’s have a name-oroshigane. These Oroshigane graters have fine teeth on one side for Wasabi, and coarse on the other for ginger and daikon. So what else can you grow that tastes like Wasabi? Wasabi Rocket is a variety of Rocket that will pack a punch with a taste very similar to that of Wasabi. sharp essential oils including mustard oils that create the pungent flavour. 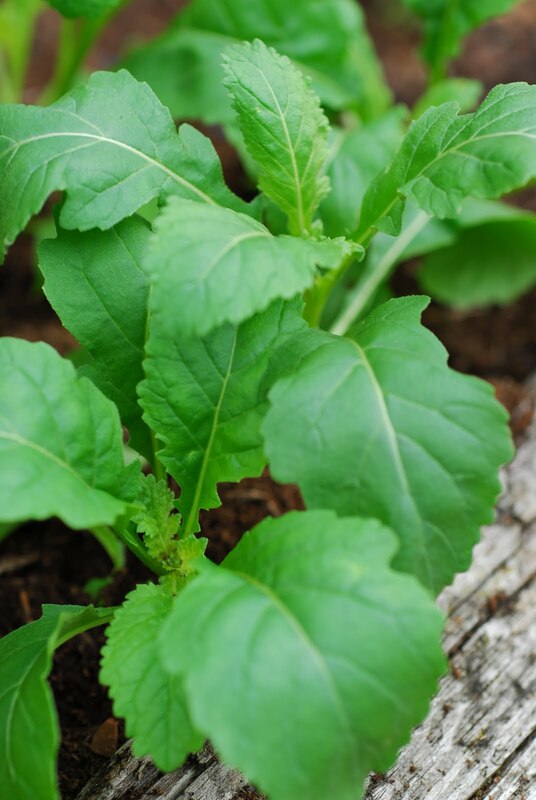 An easy to grow salad crop, Wasabi Rocket should be planted into well worked soil in a sunny position. The soil should always be kept moist but it’s quite hardy and quick growing. You’ll be eating your wasabi rocket in as little as 2-3 weeks. Even thoughWasabi Rocket prefers a full sun position it can be grown in a sunny to semi-shaded location in garden beds, tubs or window boxes. Or you could just grow it in a pot on the kitchen windowsill. The good thing for listeners around Australia is that Wasabi Rocket is frost hardy. Well apart from clearing out your sinuses, wasabi has a few health benefits too! High in vitamin C, dietary fibre and potassium, with some Calcium and protein. Wasabi and Wasabi rocket kills food borne bacteria and apparently is supposed to reduce blood pressure. The leaves are tender and are ideal as a "sharp note" in a fresh salad. This Rocket also stimulates digestion, with rich dishes such as grilled meats. I’m sure you’ve heard before that Autumn is one of the best times to get planting especially for native plants. The reason is the roots will be able to put on some real growth before the winter months, and will be ready to get growing once Spring hits. Let’s find out what preparation you need to do. If you’ve already got some plants that are thriving in your garden, and you have spaces to fill, a good idea is to choose plants that are similar, or from the same family but perhaps with a different flower or foliage colour. Yes the soil temperature is still warm enough to get good results with new plants and also get the plants in the ground and settled before the following summer months. What are some tips for planting out new beds? You need to remove all weeds and or grass from the area to be planted out – then you need to dig over the soil and see what the condition of the soil is – do you need to add more organic matter etc. Glenice says "I always look at what plants I have growing in other areas of the garden – to see what I can lift an divide or if there is a plant not doing so well – if it would do better in the new bed. For species selection I also look at what has really thrived in the garden and try and pick either more of the same species – could be in a different colour or even something which is related to that plant." If your district was lucky enough to have lots of rain over the last few weeks, that I hope your garden is exploding in colour and lush green growth. My district has been deluged with rain with accompanying high humidity, so gardening isn't all that pleasant still. So what are some tips to watch out for if you plan to go gardening after heavy rain. Let’s find out about this plant. Luckily, rain softens the soil, making weeding much easier on the hands and back. Tackle them now while they're seedlings to prevent them from taking over your garden.